Learn the basics of communication to mastering speech preparation and delivery with this engaging, dynamic text. 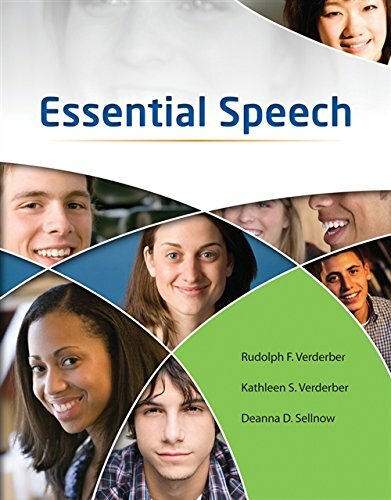 ESSENTIAL SPEECH introduces the various types of speeches as well as the keys for effective speech preparation and confident delivery. Relevant activities and examples of effective and ineffective communication make learning easier. Strong speeches begin with thorough preparation. Users develop into confident, competent communicators as they learn to research and use language and vocabulary effectively. Useful delivery strategies as well as how to perfect listening, observing, analyzing, and critiquing abilities are also addressed. This book's inviting and open visual presentation, along with numerous examples drawn from today's world, keep the presentation meaningful and engaging. Numerous hands-on activities also keep users actively involved in learning. Ongoing review and assessment ensure understanding of the concepts before moving ahead. Technology has had a huge influence on how you learn, how you work, and how you communicate today. The online Speech Builder Express tool solves the major challenges in this course: getting organized and comfortable to make a presentation, and relieving anxiety and stress caused by lack of planning and organization. Speech Builder Express coaches users through every step of the speech outlining process. By providing the necessary tutorials, sample videos, and access to a dictionary and thesaurus, this product will help build confidence, lessen anxiety, and prepare users for real-world career speaking opportunities. Discover all of the aspects of teaching speech - from concepts and practice to technology support. This book's approach is based on extensive field research and input from Speech Educators across the nation.